The standard definition of creativity is based on a tension between originality on the one side and effectiveness on the other side. Borrowing from the wave-particle duality in physics one could say that there is an originality-effectiveness duality at work for creativity. The paper explores how this tension pervades Amabile’s (1997) componential theory of organizational creativity. To achieve this, the so called value square (“Wertequadrat”) developed by Helwig (1967) and Schulz von Thun (1998) is used which balances a value with its countervalue to analyze the components of corporate creativity. The author identifies tensions of corporate tradition and corporate change for organizational motivation, skills and challenges for work assignment, management by control and management by loss of control for work control as well as organizational efficiency and organizational slack for resources. 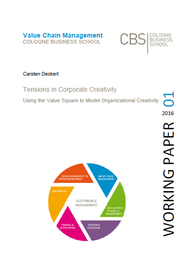 Additionally implications for resistances to creativity, the flow of creativity, the avoidance of a culture of compulsive control, freedom and autonomy in the workplace as well as resource allocation are discussed. The Working Paper can be downloaded under Publications/CBS-Working Papers.